I have a "Ready to Ride" 2002 Harley Fat Boy for Sale. Impact Blue FLSTFI with a Stage one kit done by Harley, all chrome front end, Heritage style lights, quick detachable windshield, custom HD 2-up seat, rigid leather lockable saddle bags, heated hand grips, factory security system, custom pinstriping, brand new tires and breaks, 1" rear lowering kit, lay down license tag holder. The 2002 Harley Davidson Fat Boy for sale also has a detachable passenger back rest, an upgraded speedometer with tachometer, passing lights, relocated rear brake lights and custom mirrors. 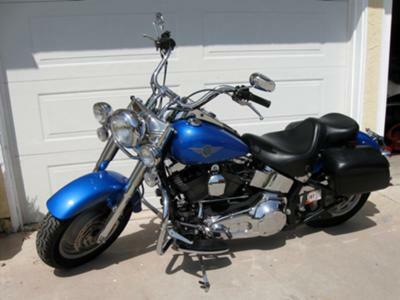 The 2002 Harley Fat Boy for Sale is 22,000 miles new and has just been serviced! The items in the list are just some of the customizations, keep in mind that that wasn't a full list. This 2002 Fatboy won't give you any problems it has made hundreds of trips and given me no trouble whatsoever. It has always been garage kept and I hate to see it go but I've injured my leg and can't ride any longer. The bike deserves a good home and is a bargain for my cheap price. You don't want to let this 2002 clean and clear used Harley Davidson motorcycle for sale with so many extras get away! I've had this HD since it had 6 miles on it bought directly from the factory. The motorcycle is priced fairly to sell quickly but I only want to receive serious inquiries and I will consider delivery for a fee. I also have a "trailer in a bag" for sale for $500 so what are you waiting for? Email me your questions and contact information in the space below provided by Strike Lightning for listing Used Motorcycles for Sale and I will get back with you as soon as possible. Strike Lightning would also encourage bikers to submit a review of the 2002 Harley Fat Boy for Sale to help potential buyers make informed decisions and to benefit the biker community as a whole.